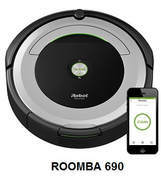 This article will compare iRobot Roomba 690 and 890 with Eufy RoboVac 11+ and 11c. Selected Roomba and Eufy Vacuuming Robots on Amazon. The iAdapt navigation technology used by Roomba 690 and 890 is composed of sophisticated software as well as sensors, and allows these robots to clean more thoroughly the room, making multiple passes, avoiding stairs, getting under and around furniture, and cleaning along wall edges and corners. The low-profile design of these robots allows cleaning under most furniture. They also automatically adjusts to all floor types - carpet, tile, hardwood, laminate and more. 1: Counter-rotating dual multi-surface brushes pick up dust, debris, dirt, pet hair from the floor. 2: A single 3-prong spinning side brush cleans along wall edges. 3: Finally, an efficient vacuum that pulls dirt and hair off the brushes and directs it into the bin. The AeroVac vacuuming technology used by Roomba 690 allows for optimized airflow that pulls hair off the brushes and sends it into the bin. Roomba 690 is equipped with a AeroVac filter that handles quite adequately hair, pet fur, lint and carpet fuzz. Each of the two Eufy RoboVac robots considered here calculates the room size and optimizes the path to be followed by selecting automatically different cleaning modes until cleaning is complete. Their versatile cleaning modes and their low-profile design allow cleaning under most furniture, and they can be used on all types of floors - carpet, tile, hardwood, laminate and more. Note that these robots also use a HEPA style filter that handles very well hair, pet fur, lint, carpet fuzz and other various allergens. 1: A rolling main brush that picks up dust, debris, dirt, pet hair from the floor. ​Note that the brush that comes with Robovac 11+ was redesigned: it is wider and reduces trapping rugs and sheets. 2: Double 3-prong spinning side brushes that clean along wall edges. 3: Finally, an efficient vacuum that pulls dirt and hair off the brushes and directs it into the bin. ​​ Note that the maximum suction power generated by RoboVac 11+ is 1000pa, while the maximum suction power generated by RoboVac 11c is 1200pa. When Roomba 960, Roomba 890 or EUFY RoboVac 11c are connected via Wi-Fi to your smartphone or tablet, you can use their associated app for Android and iOS to invoke remotely operations (such as cleaning, scheduling, etc.) from wherever you are, using your smartphone or tablet. When auto clean mode is invoked, all four robots considered here will use the navigation and vacuuming methodes described above (in Note 1) to automatically perform the vacuuimng job, intelligently covering and effectively cleaning the targeted space. The auto cleaning mode mode can be invoked by pressing the appropriate button on the robots. For those robots that support Wi-Fi, it can also be invoked from your smartphone via the associated iOS or Android app. When spot clean mode is invoked, all four robots considered here will intensively clean a specific area in a spiral manner. When edge cleaning is invoked, both RoboVac robots reduce their speed when they detect a wall and follow the wall to make sure that the edge is cleaned thoroughly. Though the Roomba robots do not have a specific edge cleaning mode that can be invoked, these robots are equipped with a 3-prong spinning side brush that cleans along wall edges as part of the auto clean mode. When you choose Max mode, RoboVac starts cleaning with maximum suction power. This is great when vacuuming carpets. Both RoboVac robots support this function. Both Roomba 690 and 890 use Dual Mode Virtual Wall Barriers whcih are small devices that can be used as "Virtual Walls" to prevent the robot from crossing doorways. These battery run stand-alone devices can also be used as "Virtual Wall Halos" to protect some restricted area within the room, like for instance the area where the dog food might be. A single Dual Mode Virtual Wall Barrier is included with each robot (if needed, additional devices can be bought below in the Amazon products section). Batteries are included. No navigation control devices are used with either Eufy RoboVac robots. Therefore, if the robot is not required to clean a particular room, the door to that room should simply be closed. The Power Boost feature built into RoboVac 11+ and 11c automatically increases suction power when extra vacuuming strength is needed to get the best cleaning results. Note that the maximum suction power generated by RoboVac 11+ is 1000pa, while the maximum suction power generated by RoboVac 11c is 1200pa. Therefore RoboVac 11c is even better suited to clean pet hair. When batteries run low, all four robots considered here return to their Home Base to dock and recharge. ​Roomba 690 and 890 do not come with a Remote Control device, but they can be controlled using your smartphone from wherever you may be. Note that, if desired, a Remote Control device can be optionally purchased (see Amazon products secton below). Both Eufy RoboVac robots come with a Remote Control device. Though RoboVac robots do not have a carry handle, they are light enough to be lifted and carried around easily. ​For exact price information on these four robots, please refer to the Amazon products section below. So which of these four robots should you buy? If you need to control your robot with your smartphone remotely from wherever you may be, you should consider Roomba 690, Roomba 890 or Eufy RoboVac 11c which support Wi-Fi. If you don't need to control your robot from your smartphone, but you still want to have a robot that can be controlled with a Remote Control device, then you should consider either of the two Eufy RoboVac robots considered here as they both come with a Remote Control device. Also note that, even though Roomba 690and 890 do not come with a Remote Control device, you can optionally purchase an iRobot Remote Control device for these robots (see Amazon products section below). While the iAdapt navigation technology used by the Roomba robots is quite capable of intelligently covering and effectively cleaning the targeted space, besides the auto cleaning mode, you can explicitly invoke only spot cleaning with regards to selectable cleaning modes. 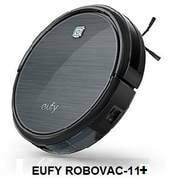 On the other hand, with both Eufy RoboVac robots, you can also explicitly invoke edge cleaning and max cleaning. Eufy RoboVac robots are slightly thinner than the Roomba robots and therefore they can more easily clean under lower lying furniture. As mentioned above, iRobot makes a number of other Roomba robots that are more sophisticated. For the average home, the robots described here should be quite adequate, but if you are looking for a robot with more sophisticated functions, such as the ability to restart automatically and resume the job after an auto-recharge, you might want to read the following article: Comparing All 2019 iRobot Roomba Robots. Please click the vacuuming robot of your choice below for price information or to purchase. If some of the prices are not shown on the Amazon link images below, they will be provided once you click the link images.